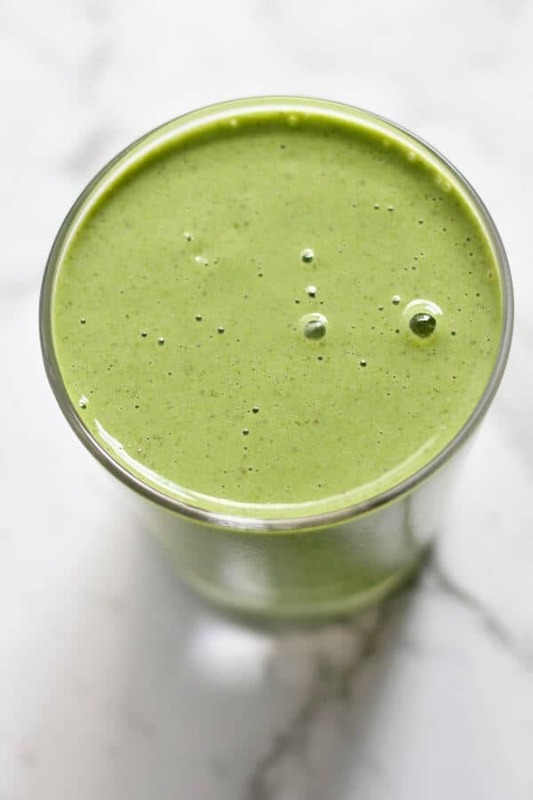 Green smoothies are perfect for a quick breakfast or a 3pm pick-me-up, not to mention a great way to sneak some more fruit and vegetables into your daily diet. But not all green smoothies are created equal. Some green smoothies can taste like grass clippings (or worse!). 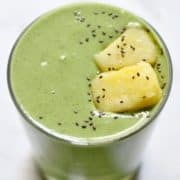 The good news is this Kale Pineapple Smoothie is one of the good ones that hits just the right green to fruit ratio to pack a nutritious punch without the bad taste. It has a refreshing, zesty and tropical flavour that will remind you of sipping cocktails on a far away sandy beach. Or at least that’s what I think of when I drink it at my messy kitchen counter trying to avoid doing the dishes for the millionth time that day. If you’re a bit apprehensive about the old green smoothie, this ones for you. You only need 6 simple ingredients to prepare this Kale Pineapple smoothie for yourself! FROZEN FRUIT & VEG: I always use frozen fruits and vegetables in my smoothies. They help give smoothies a thick, frosty texture and also help keep it cool. If you only have fresh on hand and want to make this right away, just pop a handful of ice cubes into the blender. MILK: Choose any milk you enjoy. I generally make this smoothie with soy, but have tried many others and they also work well. It all just depends on your taste. YOGHURT: I’ve used both vanilla yoghurt and greek yoghurt for this recipe and had great results with both. If your yoghurt isn’t sweetened you might want to add a tsp or two of your favourite liquid sweetener into the mix. If you need your smoothie to be dairy free / vegan, opt for a coconut yoghurt, or omit entirely and just add a little less milk. SMOOTHIE BOOSTERS: I love adding chia seeds to my smoothies for a nutritional boost. If you don’t have chia seeds at home feel free to leave them out. It couldn’t be easier to make this Kale Pineapple Smoothie. Simply throw all the ingredients in a high performance blender and blend until smooth. Viola! 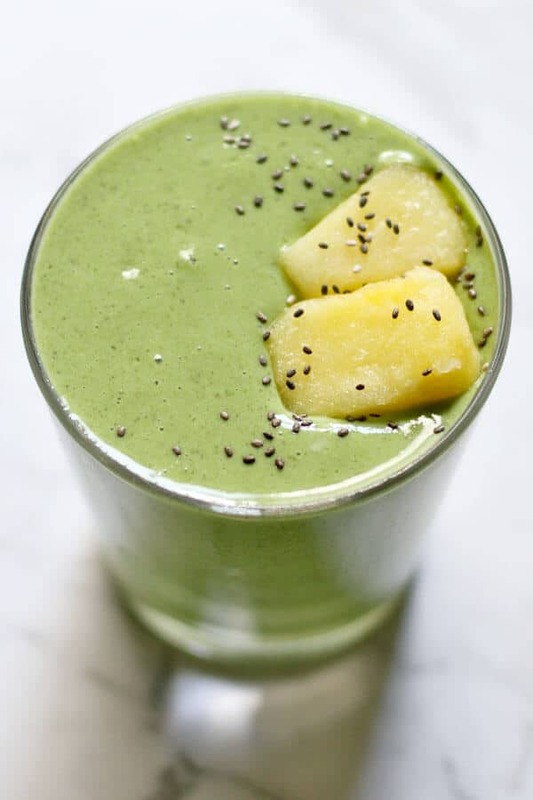 If you’ve tried this Kale Pineapple Smoothie I’d love to hear how you enjoyed it! Pop a comment and a star rating below! You can also FOLLOW ME on FACEBOOK, INSTAGRAM and PINTEREST to keep up to date with more delicious recipes. 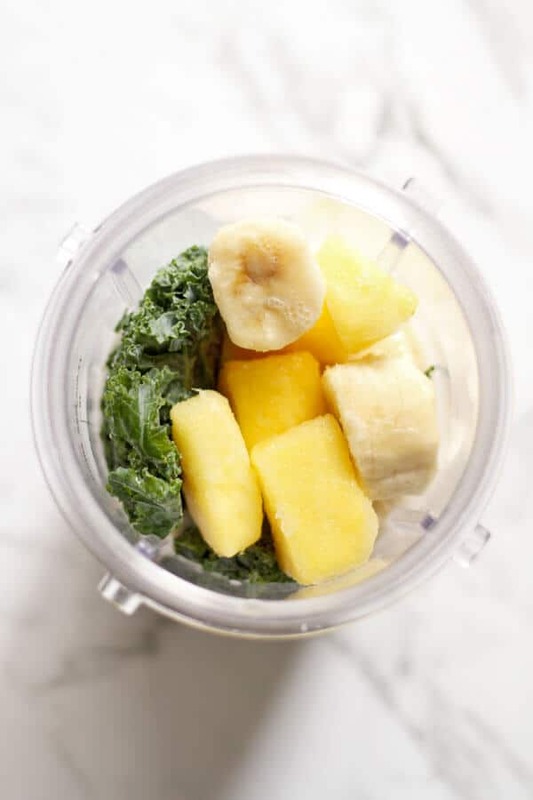 This Kale Pineapple Smoothie has a refreshing tropical taste and is creamy and smooth. Vegan, dairy-free, nutritious and made with six easy ingredients! Place all ingredients in a high performance blender and blend until smooth and creamy. Serve and enjoy! BLENDING: I use the cup attachment of my blender when making a smoothie. It's easier to clean than the jug and perfect for a single serve. If you don't have a cup attachment, the jug works exactly the same. FROZEN FRUIT & VEG: If you don't have frozen fruit & veg on hand and want to sub for fresh, just add a handful of ice cubes into the blender. MILK: Choose any milk you enjoy. YOGHURT: Feel free to sub vanilla yoghurt for plain greek yoghurt. If your yoghurt isn't sweetened you might want to add a tsp or two of your favourite liquid sweetener into the mix. You can also sub for coconut yoghurt to make the smoothie vegan / dairy free. Or omit entirely and use a little less milk. SMOOTHIE BOOSTERS: I love adding chia seeds to my smoothies for an extra nutritional boost. If you don't have them on hand, leave them out.